Nestled at the BASE of Utah's largest 'ski able' mountain (The CANYONS), our townhome is JUST OFF I-80 at the Kimball Junction/Park City Exit & only 25 MINUTES from the Salt Lake City AIRPORT. 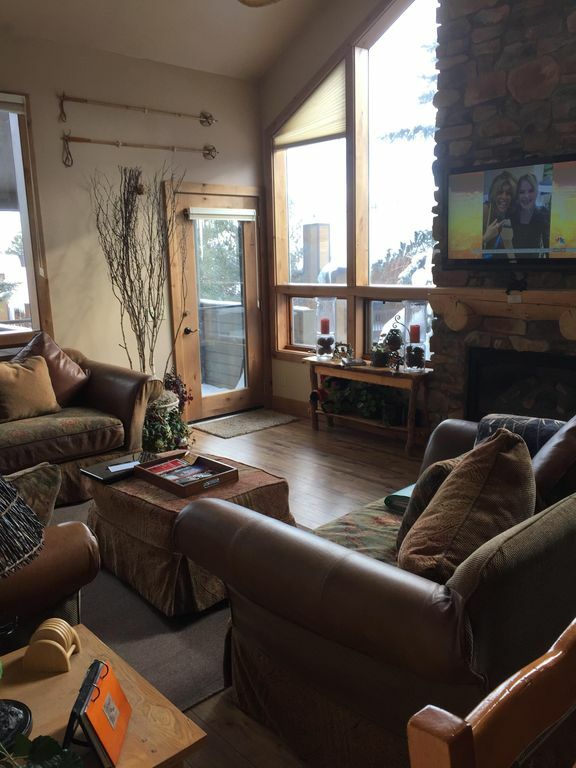 Our SPACIOUS 2000 square foot PRIVATE THREE STORY home has MOUNTAIN VIEWS from EVERY WINDOW. It has been completely MODERNIZED, Newly RE-MODELED, Impeccably DECORATED and is available as your SKI and/or SUMMER 'HOME' while you are in Park City. There are TWO PARKING SPACES RESERVED for you (1 COVERED) at the FRONT DOOR. This THREE MASTER BEDROOM plan has FOUR FULL BATHS,(4th is a 'WALK-IN' SHOWER just OFF the HOT TUB rm.) a SPACIOUS MAIN LEVEL including a LARGE Comfortably Unique Hardwood FM. RM./MAXIMULLY EQUIPTED New APPLIANCE KITCHEN and LARGE DINING ROOM with BAR EATING area. Add the SOLID WOODEN DOORS throughout allowing for PRIVATE/QUIET LIVING on all three floors makes this the IDEAL HOME for your Vacation. EVERY BEDROOM has comfortable PADDED mattresses on their QUEEN Sized BED, DOUBLE Sink/Stone VANITY, SHOWER/TUB bath, HUMIDIFIER, THERMASTAT, and TV/Blue Ray player with Flat screen. In addition, the UPSTAIRS master bedroom has its own GAS FIREPLACE and CEILING FAN while the back downstairs master additionally has a TWIN HIDE-A-BED Sleeper SOFA. The FAMILY ROOM 42 inch swivel mounted HD TV Flat screen also has a DVD/Blue Ray PLAYER and STEREO SURROUND SOUND! Beautifully plush Indian, Mining, and Wildlife decors with modernized faucets, lighting fixtures and hardware found throughout. A fully equipped kitchen includes NEW Ceasarstone/Quartz countertops with LARGE work area, NEW ULTRA-QUIET dishwasher, BLENDER, 4 slice BAGEL/TOASTER, NEW FLAT-TOP built in stove, Built in Oven, LARGE DEEP SINK, Slow Cooker, Expresso machine and multiple quiet close cabinets and drawers! The large dining room table with placemats seats eight comfortably while the bar seats four in addition. IN UNIT: Stacked Washer/Dryer and WATER SOFTENER System and new TANKLESS Water Heater allows for all the amenities of home and more! We 'grew up' skiing in Colorado with a 2-2 1/2 hour drive from the airport to the slopes. One trip to Park City Utah and it became home! With a 25 MINUTE drive from the airport to the slopes and our front door, our whole family was sold. Beautiful Mountain views from every window. Windows to ceiling in Family Room with room warming gas fireplace make our beautifully/comfortably decorated room a GREAT Gathering Place with plenty of space nearby for group meals.Each room is PRIVATE in sound and space with it's double sink vanities and tub/shower baths. Humidifiers keep you comfortable. Historic Downtown is a FREE bus ride right outside our front door and at the bottom of the street. No car is NEEDED to get to slopes, shopping, ski rental and repair, restaurants, movies, ice skating, bowling...you name it. It's available to you in minutes and with free, convenient and punctual transportation (if you don't want to park your two cars at out front door). toilet, shower, Coveniently located next to IN-UNIT spa and on main floor. NEW Public Course runs right by the Complex. From EVERY WINDOW on ALL 3 levels. Central with additional self controlled built-in wall heaters in lower bedrooms. PROFESSIONALLY LAUNDERED and placed BEFORE and AFTER each renter. New Energy Efficient PERSONAL IN-UNIT Stacked WASHER/DRYER in our LAUNDRY CLOSET on the Lower Level. INDUSTRIAL SIZE Washers and Dryers are a few feet up the street in the Locked CLUBHOUSE Laundry. Key acessable with our Frog Key Chain on the Hutch by the Kitchen. Face, hand and bath towels. 4 sets per bath except spa bath has 2 sets. OPEN CONCEPT to dining rm, kitchen and spa. Spacious, gorgeous and unique decor, comfortable sofas, MULTIPLE ceiling to nearly floor windows surround with mountain views out each one. Easy clean Flat top. Self cleaning oven. OVER Stove for MORE Counter Top SPACE. (4) HD/DVD/BLUE RAY TV in family room. EXTENED CHANNEL PACKAGE including NUMEROUS MOVIES and MUSIC. HD/Blue Ray in ALL bedrooms and Family room. Due to 'Sticky Fingers', we ask you to bring your own DVD's,CD's and VIDEO GAMES. Table and 2 chairs (during summer) on deck out back door with bottled gas Grill and Utensils under cover year round. Under construction around Redpine properties. Public courses within Park City. Shared in clubhouse and MAINTAINED by them. SHOWERS and CHANGING stalls are in Men and Women's LOCKER ROOMS. (3) One winter pool is HEATED to 98 DEGREES. IN-UNIT PASS (on key chain on Hutch by Kitchen) is for 10 GUESTS. SHOWERS and CHANGING stalls are in Men and Women's LOCKER ROOMS. 2 adult and 1 baby pool during summer. PRIVATE/PERSONAL/IN-UNIT HOT TUB open during winter season. SERVICED 2 times a week. Feels like a well equipped home at your favorite vacation spot. Well stocked home with all the essentials and most of the little extras. The hot tub located in the house was a great plus. This is a great place. Very comfortable and clean. It has three bedrooms all with their own bathrooms attached and another full bath attached to the hot tube room. Loosen up sore muscles after skiing in the hot tube located inside and then jump over to the shower without having to walk though the cold to your room. The thee bedrooms have queen sized beds making it great for couples. The main floor and upstairs bedroom both have gas fireplaces. The owner installed a tankless water heater so you'll never run out of hot water. The unit is located between Park City and Kimball Junction making it very convenient to getting to either in just a few minutes. It has a covered carport that kept the snow off of our full sized Chevy Suburban which fit perfectly. The only issue I had was the washer was broken. The washer had just broke before we arrived and parts were ordered to fix it. There is a laundry room in the club house and the owner left us plenty of quarters to make up for the washer being down. We had a great time. Having a nice, clean, comfortable place to stay makes for great memories. I would definitely recommend this property. We are Park City and VRBO regulars. The condo has a solid layout and is well equipped. It's not the best if you like to cook (Knives need to be replaced or sharpened. This was maddening and a bit dangerous but it is also a personal preference. If you don't cook, it does not matter.) Washing machine needs to be replaced or repaired as it did not work after the first load. Condo is clean and comfortable. You don't need a car. It's not on the mountain so there is a short walk to lifts (depends on your situation, it is not necessarily easy). Easy bus access to other locals. We enjoyed our stay. Perfect for a holiday family vacation! Loved the property! Close to skiing and the shuttle was only a block away! Very well stocked kitchen with all the amenities. Plenty of privacy with 3 separate bedrooms and bathrooms. Best part was the hot tub after a day of skiing or snowshoeing. Hope to return soon!!! This is a very well maintained facility with plenty of room for 6 to 8. All the amenities one will need staying in the Park City area...!!! 1 1/2 miles to Utah Olympic Park (Tours, Zip-Line and Bobsled rides), 2 miles to Historic Downtown Park City, Sledding & Hot Air Balloon Trips, FREE city shuttle BUS service within 125 ft. from our front door. If you need the 'big' city remember Salt Lake City is 20 minutes away! Contract, sent after $500.00 REFUNDABLE Confirmation/Damage Deposit check is received, will have all terms printed again. Welcome Packet will arrive a few weeks before your arrival with coupons, trail maps, directions, phone nubmers, brochures, area and attraction maps, information, etc.